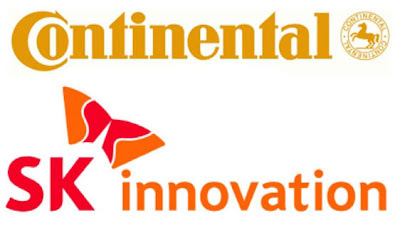 German car parts supplier Continental AG and South Korea's SK Innovation Co Ltd plan to invest several hundred million euros in a joint venture developing lithium-ion battery technology for electric cars, an executive said. Robert Lee, the joint venture's chief executive, said the first contract from an automotive client was expected by the end of this year, or by the first quarter of 2013 at the latest. "We expect to generate our first revenue in 2015 and reach break-even about two years later," Lee told reporters in Frankfurt after the signing ceremony. Continental currently forecasts pure battery-driven cars will make up 1 to 2 percent of global new car demand by 2020, with another 8 to 9 percent being hybrids. The cooperation deal, which was initially agreed in January, is the second link-up between a major German parts supplier and a Korean company strong in electro-chemistry and battery cells. Continental's arch-rival Bosch had formed a 50-50 joint venture in September 2008 with Samsung SDI called SB LiMotive, in which the two companies planned to have invested 500 million dollars by 2013. Bosch is reviewing its involvement in the electric battery joint venture, however, and could decide to act more as a supplier than a partner. Press reports have said the JV could be dissolved following a disagreement over strategy. Lee said SK Innovation and Continental had spent a lot of time planning how to structure and operate the deal and both would pour all their activities in this field into their joint venture, split 51 to 49 percent, with the Koreans holding the majority. "We have ensured that both companies are fully committed for a very long time. The contract makes it very challenging for both parties to exit the joint venture," Lee said.